This is a 5 tube "All Wave" (3 band) superheterodyne "tombstone" radio with an airplane dial. The chassis was manufactured by Belmont Radio Corp. The Goodyear company was founded in 1899 and became the largest tire and rubber company by 1916. The "Wings" logo, patterned after the winged foot of Mercury, was introduced in 1901. 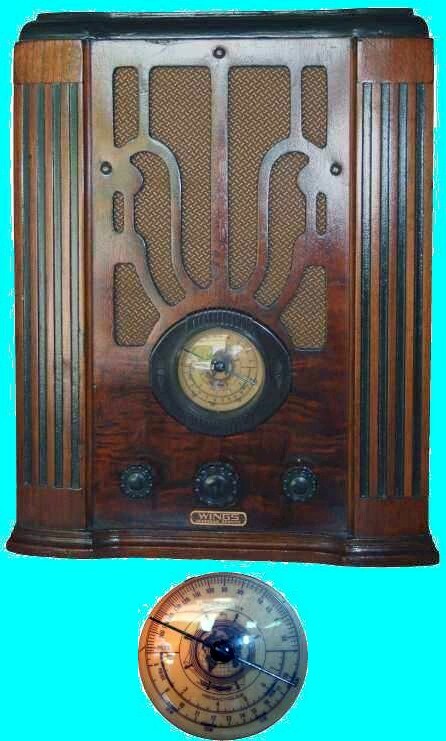 Apparently, at least during the later 1930s, Goodyear marketed radios with their "Wings" brand. Tubes: 6F7, 6K7, 75, 6F6, 80.